J.D. Power’s annual paint and stain satisfaction study found that Benjamin Moore products dominate in three out of four categories. The study fielded responses from 8,144 customers who purchased and applied interior paint, exterior paint, or exterior stain in the past 12 months. It questioned each customer’s satisfaction with interior paint, exterior paint, exterior stains, and paint retailers. Interior and exterior paint and exterior stain satisfaction was judged on a 1000-point scale that included six categories: application; durability; in-store color displays and printed materials; price; product offerings; and warranties and guarantees. Benjamin Moore swept both the interior paint (853) and exterior stain (828) categories, ranking highest for durability, product offerings, and warranties in both categories. 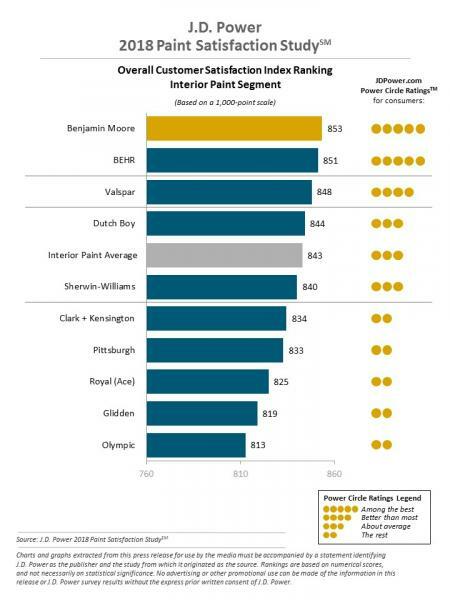 Behr (851) ranked second for interior paints, and best in the in-store color displays and printed materials category. Sherwin-Williams (826) ranked second for stains. 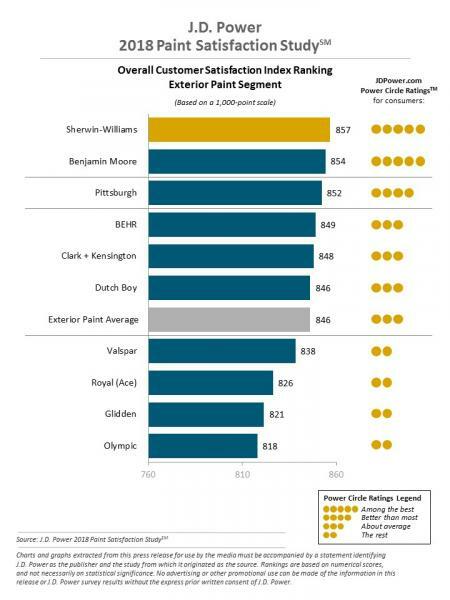 Sherwin-Williams grabbed the top spot for exterior paints (857), doing well in the application; in-store color displays and printed materials; and product offerings factors. 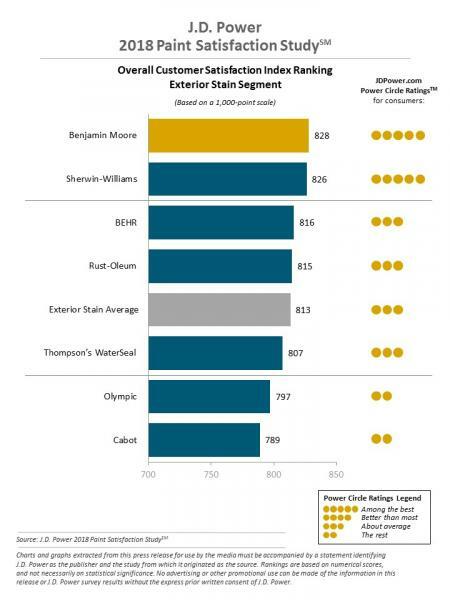 Benjamin Moore, at 854, fell just behind behind first place but ranked highest in the durability and warranty categories. 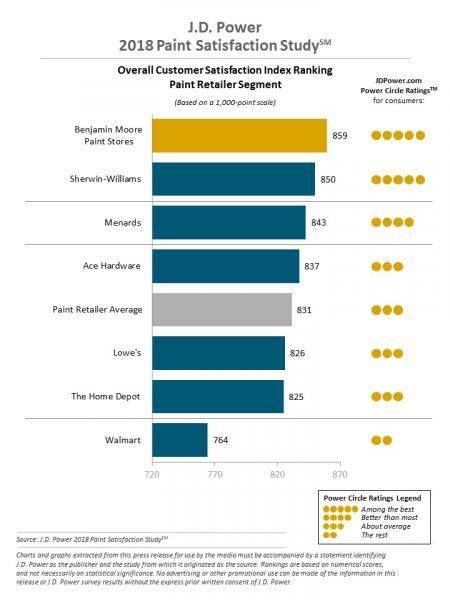 Paint retailer rankings were based on five factors, including merchandise; price; sales and promotions; staff and service; and store facility. Benjamin Moore once again took the lead in this category with a score of 859. Sherwin-Williams (850) ranked second, and Menards (843) ranked third. In-store experience can have a huge impact on paint and stain satisfaction. Seventy-seven percent of paint customers make a purchase on their first store visit. Product satisfaction tends to be higher among purchasers who speak with a sales associate at length rather than briefly or not at all, but only only one-third of respondents reported doing so. The study also found that satisfaction is a main driver of brand loyalty. Of customers who gave overall satisfaction scores of 901 and above, 76 percent reported that they “definitely will” repurchase the brand and 79 percent said they “definitely will” recommend the brand to others. On average, the study only reported these definitive responses 46 percent and 47 percent of the time, respectively.